Tilly and the Buttons: Stash Amnesty! Reading the comments on my Tidying Up post made me think it would be fun to take a sneaky peek at other people's sewing stashes too. Moreover, what better therapy for the fabric stasher themselves than to come clean to the world about all the stuff they've been accumulating? With this in mind, I approached Jen from Pretty Little Pictures to see if she would be up for an interview about her sewing space and stash. Consider this the pilot for a "Stash Amnesty!" feature - if you like the idea of this post, I'll make it a regular thing (or if you think it's rubbish, I'll drop it). 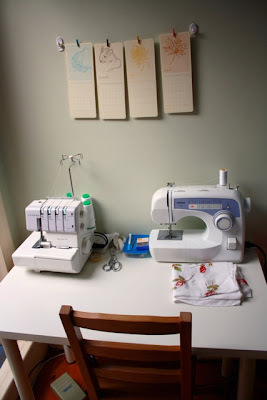 What's your sewing area like? Jen: "I have just recently moved to Sydney, Australia from Dunedin, New Zealand. We currently reside in a quaint, but rather small one-bed semi. As our current space is so small, my fiance and I have had to be some what imaginative with our space. Half of our lounge is dedicated as a small space for our own individual use. My fiance works from home so his space is set up as a little office, surrounded by books. 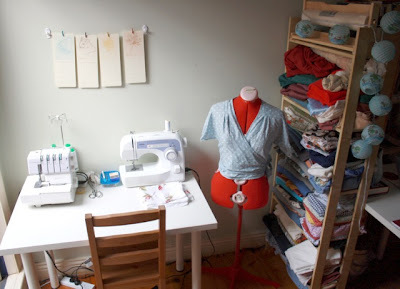 Mine on the other hand is my dedicated sewing space - surrounded by a book shelf of fabric. 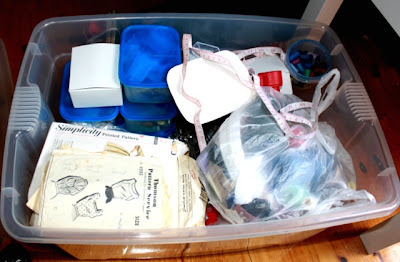 I use two big plastic storage bins to house all of my patterns, thread, zips, buttons and all number of sewing related bits and pieces. 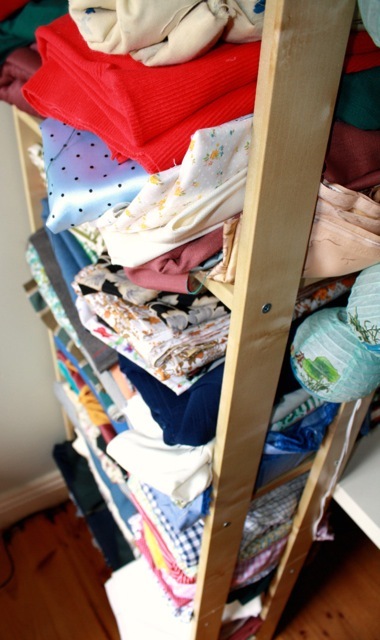 And while the bookshelf holds the bulk of my fabric, there is a teeny weeny pile building up behind my desk that I opted not to show you, because it's slowly getting out of control. I need to learn not pile everything up in one corner, because it will eventually fall over..."
How long has your stash been accumulating? Jen: "My stash has been accumulating for a good 4 years now. But I did have to get rid of some of the excess before we left New Zealand - a very hard thing to do! I'm one of those people who is sure they will use it for something - even if its a tiny little scrap! In saying that, I'm not quite sure I got rid of quite as much as I thought I did. (read above statement: growing pile of fabric behind my sewing area that you cannot see..."
Where do you source your fabric? 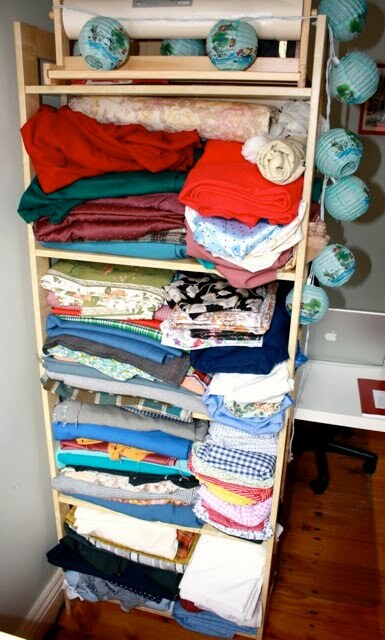 Jen: "A lot of my initial stock came from opshops (thrift stores) in New Zealand. I had a few really great stores that I frequented that always had masses of really great quality fabric. I haven't had much time to scour Sydney though, so what I have bought while I've been here has been mostly off ebay - they always have some really great vintage fabric every time I look." 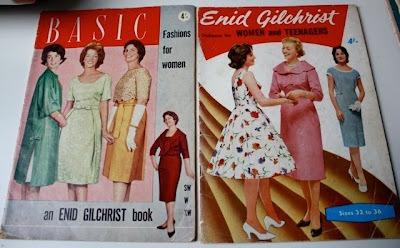 "I also adore my vintage magazines - all of the ones I own still had their original patterns with them. I had found three in New Zealand last year and this year I've hit a goldmine and have added several more to my stash (also including their patterns). 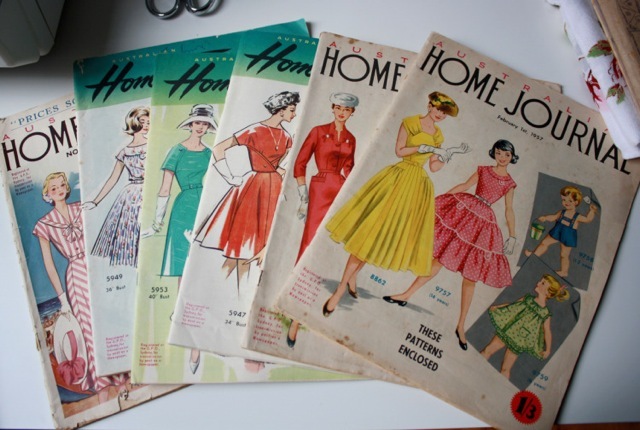 I'm not all that good at acurately dating vintage garments and I've found the magazines to be such a useful resource when it comes to not only dating garments, but to studying the styles of a particular period. I also love the advertisements - they are cheesy and all round fantastic!" What item has been dwelling unused in your stash for the longest? Why oh why?! 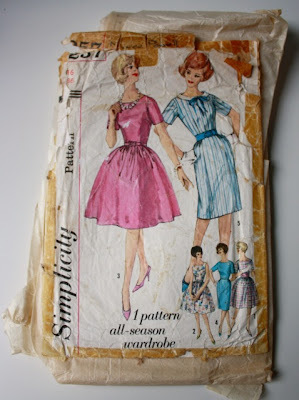 Jen: "Haha, well actually, that would be some of my vintage patterns!! I have some beautiful ones but they can be just so darn complicated!! Like a good dress should be I guess :) I haven't attempted them yet because I'm still building up my knowledge on using vintage patterns/sewing techniques and really don't want to get stuck into something that I know will cause me grief (I have been known to get so frustrated with a pattern that I just burst into tears - seriously!!). I will soon be delving into them with relish, but until then, I am content to look and dream of the day..."
What projects are you planning to downsize your stash? Jen: "Oh so many!! My first real Sydney summer is fast approaching which means lots of light, airy dresses will be needed. I've just finished making a 60's wrap blouse (which you can see unfinished on my dress makers form) which I've wanted for such a long time. I had to tweak the pattern here and there, but I love the design and think that there will be many more made very soon :) I've also just started on another dress that is actually an autumn dress, but I think I will be able to squeeze a few wears out of it before the heat hits. It's got some very interesting techniques that I've not tried before so I'm excited to give them a go." Thank you, Jen! With a stash full of such lovely things, who would want to cut it down?! Should this become a regular post? Readers - are you as nosey as I am? Stashers - want to be granted amnesty? If you'd like to feature in a future Stash Amnesty post, get in touch!